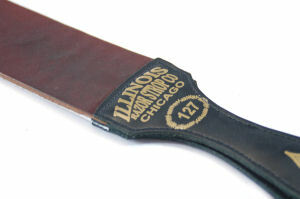 The Illinois #127 Razor Strop measures 2 1/2" wide and 23" long including hand grip, and has a sturdy clip for hanging. This strop has two sides, a leather side and a linen side. The linen side is for initial stropping and the leather side is for fine stropping. This strop is fantastic for sharpening straight razors. This is our most popular strop for straight razors. It is similar in construction to the Illinois #206 Razor Strop and the Illinois #835 Razor Strop but it is longer and wider than either of those. The extra length and width makes it easier and faster to use. Q. Do you recommend Razor Strop Dressing for your Razor Strops? A. Yes. The leather on Illinois Strops is treated to provide a good surface for stropping and dressing is not required on your new strop. However, the addition of Fromm's Razor Strop Dressing improves the texture, creating an ideal stropping surface. Older strops that are showing signs of hardening or drying out can also be rejuvenated with Fromm's Razor Strop Dressing. A. 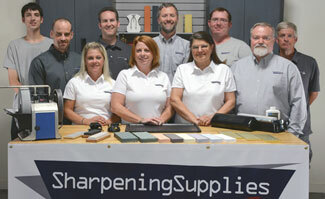 To see a comparison of the strops, see our article Comparing Razor Strops. It is a helpful guide for finding the right strop for you.